Starting in 1941, when NIPPON SHOKUBAI CO., LTD. (hereinafter referred to as "Nippon Shokubai") pioneered the commercial production of phthalic anhydride in Japan, the company has independently developed a wealth of catalytic technologies for the efficient production of chemicals and has advanced and expanded its business globally. Their products are used in a wide range of applications, such as superabsorbent polymers, which can absorb up to 1,000 times their weight in water, and acrylates, which are used in paints, adhesives, and printing ink. They are the world's largest producer of superabsorbent polymers, which is used mainly in disposable diapers but also has applications in fields such as anti-desertification and afforestation. Its technological innovations for the production of acrylic acid have been adopted by chemical companies worldwide. The Himeji Plant is Nippon Shokubai's largest and most important production site. In addition to acrylic acid and superabsorbent polymers, it produces materials used in electronics, flat panel displays, printed circuit boards, and other IT related products as well as catalysts and materials for "green" renewable energy applications. As the company's "mother plant," Himeji Plant plays a global manufacturing support role. Coinciding with the construction of a new facility at the Himeji mother plant, Nippon Shokubai decided to introduce the latest FOUNDATION™ fieldbus compliant instrumentation in order to enable a transition to a predictive and preventive maintenance approach. This initiative was prompted in part by the prior introduction at the Himeji plant of Yokogawa YVP valve positioners that used the HART (highway addressable remote transducer) communications protocol. The switch to the FOUNDATION fieldbus technology has enabled full-digital, bi-directional communications between field assets and control systems. The fieldbus devices have a self-diagnostic capability, which contributes to predictive and preventive maintenance. To control the new facility, Nippon Shokubai turned to Yokogawa for a solution, selecting the CENTUM CS 3000 distributed control system (DCS) and the Plant Resource Manager (PRM) plant asset management system on the strength of Yokogawa's strong track record in fieldbus projects and the proven reliability of these platforms. The choice of PRM was driven by the desire to achieve a predictive and preventive maintenance mode of operations by means of field device parameter management, historical message management, and trend monitoring. Nippon Shokubai established a new monitoring system and standardized operating procedures by reviewing and configuring parameters of YVP fieldbus valve positioners. Daily monitoring scenario: Check device error messages collected by PRM once a day and inspect depending on urgency. According to the result, determine whether to overhaul a valve at a scheduled shutdown. Six instrumentation technicians of varying skill levels took turns doing the monitoring. In one case involving a butterfly valve, a "servo output drift warning" occurred frequently. This alarm was set off whenever the SERVO_OUTPUT_SIGNAL (the output current from YVP to the I/P module) went outside the allowable range within a given period after a valve position change. During a scheduled shutdown, the instrumentation technicians conducted an inspection and found a loose hex socket bolt on the crankshaft. This prevented a possible unplanned plant shutdown and is something that could not have been detected with traditional analog instruments. Scheduled shutdown scenario: PRM collects signature data from all valves, and overhauls are performed on those valves that produce abnormal readings. Case 1: In a PRM step response test, a valve with an unstable fully-closed position value was identified. A visual inspection during the valve overhaul determined that part of the feedback lever between the positioner and the valve stem had worn away. The lever was replaced. Case 2: A PRM step response test of a boiler feed water valve identified that the valve was not fully opening. The cause was a lack of clearance between the body and the inner valve as a result of scaling on the inner valve. Red line: The valve opening position remained at approx. 75% before maintenance; it was not fully opening. Blue line: The valve fully opens after maintenance. Case 3: During the scheduled shutdown that took place one year after the completion of the new plant facility, a PRM step response test showed a slight overshoot in the data at each 25% increment / decrement in the opening position set point. An overhaul was conducted during the next scheduled shutdown that identified a possible cause: scaling caused by erosion (rough surface) in the head of an inner valve. In each of these cases, a problem that could have led to an unplanned shutdown was identified and corrected at an early stage. PRM improved efficiency by narrowing down which valves were in need of an overhaul, normally a very time consuming task. This was a step in the direction of condition based maintenance (CBM). PRM's historical records were used to determine the right timing for valve maintenance. To monitor valve performance, data on items such as a positioner's actual opening position and stroke were periodically collected and used in troubleshooting problems such as seat leakage in large butterfly valves. In this particular case, an investigation of the actual opening position using PRM historical records showed that a 1.4% misalignment in the shutoff position had developed in just one year. With PRM, it is easy to identify and address such problems. This represents another step in the direction from time based maintenance (TBM) to CBM. Many fieldbus devices have multi-sensing functionality, i.e. the ability to perform more than one type of measurement. In some cases, this eliminates the need for an existing device. 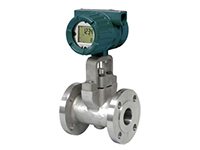 Case of vortex flowmeter: The digitalYEWFLO (DYF) vortex flowmeter has a built-in temperature sensor in its vortex shedder that enables simultaneous measurement of flow and fluid temperature. 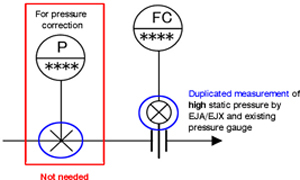 A DYF and a temperature indicator were installed on the same flow line. Their readings were analyzed to identify whether they diverged at any point. In so doing, it could be determined whether it would be possible to operate without the temperature indicator. The temperature readings from the DYF's built-in temperature sensor and the temperature indicator (TI) were almost identical, meaning that the temperature indicator could be eliminated. 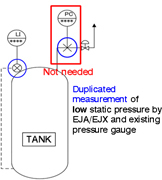 Case of pressure transmitter: EJA and EJX fieldbus pressure transmitters can sense both high and low static pressure, and are thus suitable for differential pressure measurement. The pressure trend data from the EJA/EJX and an existing pressure gauge were confirmed, showing that in some cases (depending on process and site) it would be possible to eliminate the existing device. Though not all assets can be subjects for reduction, it is expected that such efforts will result in an overall reduction in the number and type of spare instruments that must be kept in inventory. InsightSuiteAE (ISAE) is a Yokogawa VigilantPlant Services™* solution for monitoring, diagnosing, and optimizing the use of plant assets. 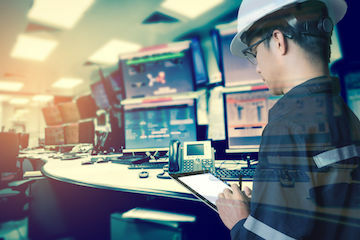 Yokogawa works together with the customer to identify issues at an early stage, put forth proposals for improving efficiency, reduce maintenance and operating costs, and supply systems and services to reduce energy consumption and achieve a smaller carbon footprint. Nippon Shokubai introduced ISAE to improve the reliability of diagnosis and parameter setting, utilizing data collected by PRM. * VigilantPlant Services™ is a suite of comprehensive services that realize Yokogawa's VigilantPlant concept, helping manufacturers achieve safe, reliable, environmentally friendly and profitable plant operations. From design through project execution, operations and maintenance, VigilantPlant Services make it possible for manufacturers to maintain Operational Excellence over the entire plant lifecycle. Analysis of alarm history: A field asset KPI report containing statistics on the alarm history showed that YVP SERVO_WARN alarms, an equivalent to the servo output drift warning, occurred frequently. The set point was subsequently changed for the five valves producing the most alarms, reducing alarms for 90% of the YVPs. Control valve diagnosis: Trend monitoring of TOTAL_CYCLE_COUNT (the total number of changes in valve direction) identified five control valves that showed the greatest increase in the number of alarms generated. From this, it can be predicted that the gaskets in these valves will deteriorate first. This result is leading to CBM. 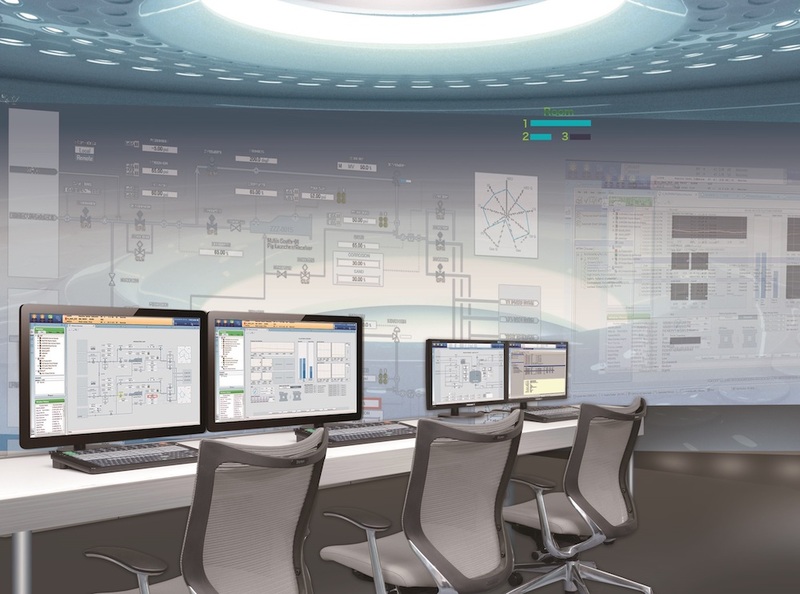 Nippon Shokubai commented, "Yokogawa has been helping us since the initial phase, from considering the introduction of the fieldbus systems to carrying out design and helping us run the plant more efficiently. Our plant is stable and no major problems have been reported to date. Recently we have asked Yokogawa's further support with establishing technology for predictive and preventive maintenance by analyzing assets with InsightSuiteAE." 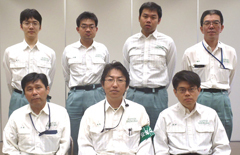 Personnel from the Himeji Plant's Electrical Instrumentation Dept., Engineering Div. Yokogawa's vortex flow meters are long-lasting and robust, offering field-proven sensor technology and high reliability to deliver improvements in plant efficiency and reduce OPEX.